I once read an article where someone had said that landscape architecture could be the greatest of the art forms because it is capable of engaging all five of the human senses. 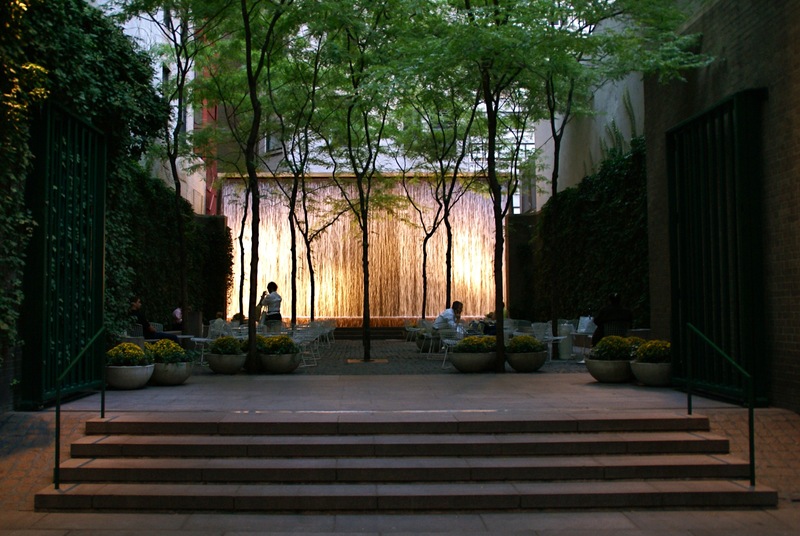 I would add that landscape architecture can also evoke another powerful human sense – that of memory. I often hear stories from people about how the scent of a particular flower, the visual-tactile space created by a certain tree canopy, or the taste of a certain vegetable from the garden can powerfully transport them to another place or time. During my first studio class in the MLA program at UW (University of Washington, Seattle), the first assignment I was given was to describe a personally meaningful landscape. Most students described a favorite backyard – a beloved parents’ or grandparents’ yard where they felt safe, where memories of made-up games with siblings or cousins and celebratory picnics with family happened. My description was of the deafening, terrifying edge of Niagara Falls in upstate New York. I was born in the City of Niagara Falls and my family frequently traveled to the city when I was a young child to visit family and friends. We always visited the city’s namesake natural feature. The pathways and security railing allowed people to get close enough to the thunderous roar of the waterfall so that you could feel the ground vibrate as the enormous amount of water rushed over the falls, falling down almost 200 feet. I readily recall that powerful landscape experience. This memory connects me not only to that specific place, but also to other memories of extended – and now dwindling – family and history experiences of the area. As a landscape architect I strive to make meaningful places for entry, connection, rest, enjoyment, and recreation. My goal is to create places that are useful and beautiful, places that evoke memories too…hopefully sans the terror of a powerful waterfall. Creative Commons photo via Wikipedia. 2. When you and your colleagues walk along the street or plaza during lunch time, the conversation will inevitably steer toward discussion about the paving materials and score lines under your feet. 3. Whichever city you travel to, you’ll search for the best landscape projects first. If you’re in NYC, you’re off to Central Park. In Chicago? You’ll head toward Millennium Park. In Seattle, it is Gas Works Park. But anywhere in Copenhagen is worth investigating! 5. You are known for taking seemingly random photos, but only your colleagues know you’re snapping reference images for a current or future projects, or perhaps for a rendered model. 6. You’re impressed when someone mentions the name, “Olmsted”. 7. You have a collection of endless shades of green markers. And, yes, THEY ARE REALLY DIFFERENT COLORS! 8. The word “grading” has a completely different meaning to you than most people. And it does not involve a report card. 9. You’re apt to exclaim, “The plants are happy!” after every rain. I just took the Section 4, inspiring what could be considered a fairly dry – but essential – topic related to the profession of landscape architecture and Landscape Architecture Month. Part of becoming a landscape architect is this licensure process, an exam is administered by the Council of Landscape Architectural Registration Boards (CLARB) in the United States. In California, the LARE exam is actually administered by the Landscape Architects Technical Committee, which operates under the state government’s Department of Consumer Affairs. The California Department of Consumer Affairs consists of numerous professional boards and committees. The initial process can be a bit confusing, as one has to first complete an eligibility application with the LATC. The state then must deem an individual eligible to take the exam at a cost of $35 for the application. The candidate also has to open a council record with CLARB, and needs to renew it every year while taking the exams. The fee for the council record is $150, renewable every year. The Landscape Architect Registration Examination (L.A.R.E.) which assesses the ability of prospective licensees to protect the public’s health, safety and welfare. After the LATC approves the eligibility application, the candidate can register for any one or all of the exams once the registration period opens. The registration period opens several months before the examination time frame which occurs three times a year in April, August, and December. There are 4 national exams and a supplemental exam in California. Section 1 (Project and Construction Management) and Section 2 (Inventory and Analysis) cost $350 each. Section 3 (Design) and Section 4 (Grading, Drainage and Construction Documentation) cost $540 each. After passing all four exams, one must take the California Supplemental exam which costs a total of $310, which includes the application and exam fees. In total, one spends a minimum of $2,275 to become a licensed landscape architect, requiring a hefty annual fee to maintain licensure. Is it worth it? Absolutely. I believe that obtaining one’s license really solidifies an individual’s dedication to the profession and one’s competency to protect to health, safety, and the welfare of people and the environment. I find that to be successful in passing the exams, one must understand not only the content that you’re being tested on, but also how to study and how to take the exams. For those who are interested, there is a lot of study material and tips from your fellow coworkers, books, and websites that you can reference. Feel free to ask me any time!